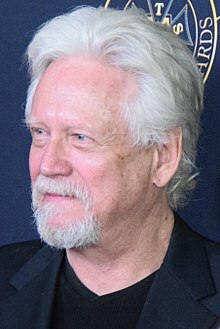 Bruce Davison (born June 28, 1946) is an American actor and director. Davison is well known for his starring roles in the horror movie Willard (1971), Longtime Companion (1989) and in the X-Men movie franchise – through X-Men (2000) and X2 (2003) as Senator Robert Kelly. Davison won a Golden Globe Award for Best Supporting Actor and was nominated for an Academy Award for Best Supporting Actor for his role in Longtime Companion. ↑ "Bruce Davison annulled marriage". ↑ "A Role as a Gay Companion Brings Bruce Davison An Oscar Buzz". Retrieved October 12, 2014. ↑ Denise Ames (June 22, 2015). "One-on-One with Oscar-Nominated Actor Bruce Davison". The Tolucan Times. This page was last changed on 15 September 2018, at 20:19.